Since late last year I have been altering my existing iOS Apps to make use of the 4 Inch display of the iPhone 5 (and iPod Touch 5th Generation devices). Likewise, all my new iPhone App developments will be 4 Inch ready from launch. For apps that already exist in the App Store, but which only offer the standard iPhone resolution, users will see black borders at the top and bottom of the app screen. This is far from ideal, and I would recommend updating your applications. Upgrading is straightforward, you just need to decide how to best leverage the ~18% extra screen real estate. If you have constructed views within Xcode's Interface Builder, then you can modify your views and objects to grow, move or stretch as you desire, so that you can accommodate more text on the screen etc. 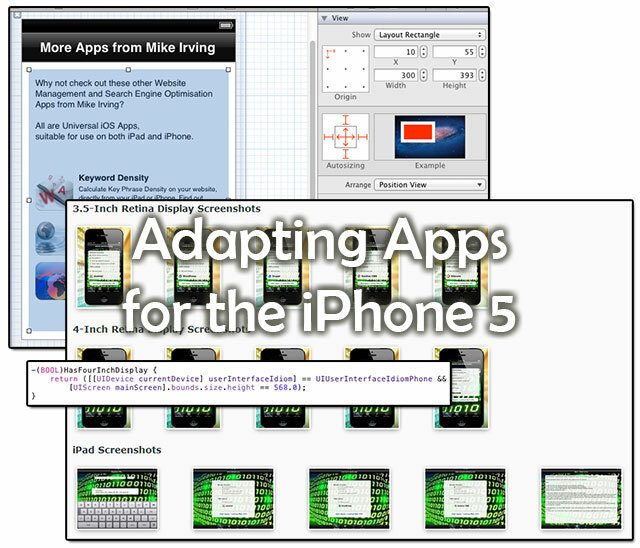 Another tactic you can use is to do something specific for iPhone 5 users, i.e. show additional items on the screen, or use a longer background image. To do just this, I use the following Function within Xcode to determine the device in use. I place this code within the AppDelegate file. Once I have made my apps, I test them on all iPhone iterations (iPhone, iPhone Retina 3.5 Inch, iPhone Retina 4 Inch), and also on iPad where appropriate. In addition to thinking about layout, you will need to make some additional imagery for the iPhone 5 too. An additional Default / Start Screen is needed... which should measure 640 x 1136 pixels. Likewise, in iTunes Connect you will need to provide additional screenshots for the Four Inch Display, at the aforementioned resolution. Updating your apps needn't be a chore. Where possible you could combine the "upsizing" process with bug-fixing and feature adding.